So how esoteric is Isis, anyway? I’ve just returned from the Esoteric Book Conference in Seattle. Seattle played itself quite nicely and came through with the requisite grey morning on Saturday and actual rain complete with thunder on Sunday. You could tell a lot of the crowd was local by the sighs of relief. There was even one dancer in the rain. And this is one of the many reasons why I love the Pacific Northwest. Many thanks to conference organizers, Catamara Rosarium and William Kiesel and the whole EBC crew. They did a wonderful job of making the conference flow smoothly. Kudos also to Kate Merriwether-Lynch, who was volunteer coordinator and bookseller extraordinaire and Joshua Madara, who made sure the tech worked for everyone. And they both presented as well. I went to every one of the presentations and enjoyed them all in different ways. In case you’re curious, here’s a link to the lineup. I met lots of wonderful, magical folks and enjoyed myself very much. On Wednesday evening, I’ll be speaking with Karen Tate of the Voices of the Sacred Feminine podcast. Karen’s work is to bring Goddess to a wider, less esoteric audience. Between the two appearances, I find myself pondering how esoteric Isis is? And how esoterically hidden or exoterically out of the closet do I want to be personally? 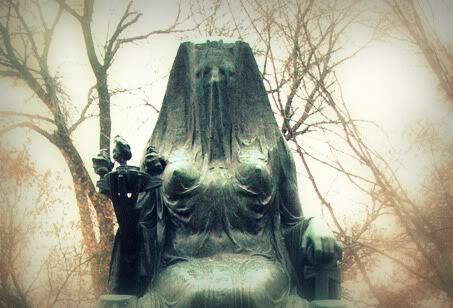 Esoteric Isis Veiled; weirdly, from the Herbert Hoover National Historic Site. It was a gift from Belgium for Hoover’s famine relief efforts in WWI. The Goddess is veiled as the Mystery of Life. She holds a triple flame of past-present-future and in Her other hand, a key of life. Seated, She is 7 ft. tall. If I’m ever in Iowa, I know where I’m going. On the other hand, most educated people, at least in the western world and I suspect much further, have at least heard of Isis. Whether via that old Isis TV show, a comic book, mythology study in school, or as a computer program, they’ve at least heard of Her. When I pay for something with a card with my name on it, clerks often ask me what my name means. When I explain it means “Gift of Isis,” they usually say something like, “Oh yeah, isn’t she that goddess who…?” So, exoteric? Exoteric Isis? I really put this image in just because she’s so awesome. In terms of my own esotericism/exotericism, I never speak about my spirituality except among those who already know. I don’t wear occult jewelry at work. I don’t trade Christmas for Yule; if I want Yule off, I take a vacation day and consider Christmas a bonus. Those with alternative spiritualities can still suffer some serious discrimination and that’s just not my fight (though I greatly admire those whose fight it is). Of course, if you put my name in a search engine, you’ll pretty quickly find me as author of Pagan books. Nonetheless, small-group esoteric is working for me. At least so far. I don’t really have any exciting conclusions here, but I’d be interested in knowing your thoughts. Are you exoteric or esoteric? Do you find that people generally know Who Isis is or not? Glad the conference went well. I’m sure you wowed ’em good. No one, of course, can advise you on how out there you want to be, But I don’t think I would be comfortable as a public pagan. I blame it on my Scorpio moon! Great that the conference went well and I hope it boosts the spread of your important and beautiful message as enshrined here and in your books. I used to be quite esoteric about my beliefs but lately, having been called by the Goddess, I am a lot more open about them. Have to admit I would not, as yet, elicit my spiritual path on a CV for work purposes, but I am happy to tell anyone that I am pagan and Isian and I recently had an image of the Goddess tattooed onto my forearm. A real affirmation for me. The worship of Isis, as we all know, only became esoteric with the closing and destruction of her temples in 4-5th century CE. It is my dream to open a public sacred space dedicated to Her here in the UK one day, to make the esoteric exoteric once more. Blessings. Interesting question. I think a lot of people know who Isis is, at least in a superficial way. I know lots of non-Pagans who have a passing familiarity with her image, but I suppose she’s esoteric in the sense of her mysteries, which is probably true of any deity. As for me, I’ve always been completely open about my Pagan faith. Congrats on a successful book convention. … with regards to Isis, I find that most folks at least know “of” Isis, but few actually have the background of understanding who she is and what she is about. 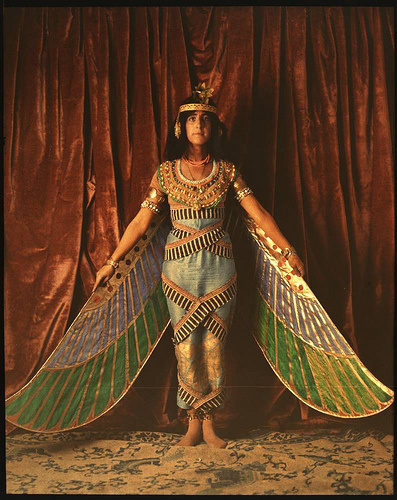 Few can distinguish Isis from any other female Egyptian deity. I am alright with that, as I know those that are called can find the information. Is Isis esoteric or exoteric? As several others have said, I think (as with so many things) she’s sort of a “both/and.” As far as polytheistic deities are concerned, she’s one of a small handful that is not Graeco-Roman that many average people might be able to name…if they know how to pronounce her name. (One of my younger brothers used to pronounce her name as if it was “is is,” which then made me think she was the Goddess of Bill Clinton in the Lewinsky trial.) But, do those people know what she’s actually about, or could they point to a picture of her amongst other goddesses? Then she’s very definitely esoteric. As for being esoteric or exoteric as oneself: I’m in the “both/and” category as well. Yes, I have a rather large pagan/polytheist public presence, in my own small way; and yes, while I did come out earlier this year about my legal name, I still don’t explicitly connect them on a regular basis in order to avoid some difficulties. (The info is there if people are looking for it and know where and how to look.) My coming out was necessitated to a large degree by a situation of anti-pagan prejudice that I was dealing with in my workplace, and I needed to be able to marshall my forces, as it were, in order to prepare to deal with that in every way possible if it came to it (and, luckily, it didn’t), but it is done. So, some of my workmates now know I’m pagan, as do some of my students (particularly the pagan ones, which has been a great relief for them because we all operate in these small rural towns that aren’t very welcoming to pagans…which is itself an irony). I do wear a visible symbol of Antinous at all times, no matter what I’m doing outside of the house, but most people don’t know what it is, and very few ask about it either. I think it’s one of those things which one has to find one’s own level on, and as long as both you and your Goddess (es, and Gods!) are all right with it, then there’s no problem and it’s no one else’s business. Reblogged this on Chrysalis Goddess.